Welcome to Driscoll Families' Math Resources! 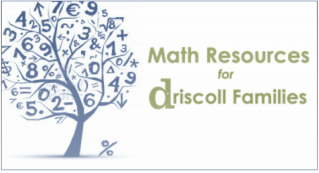 This website offers resources for Driscoll families around math -- at school, at home, and beyond! Read below to learn more about the website's features. Check out the powerpoint from the Parent Coffee about Supporting Your Mathematician in May 2017.. Check out the powerpoint from the Parent Coffee for the Website Launch in March 2016. Explore Driscoll's math community electronically! 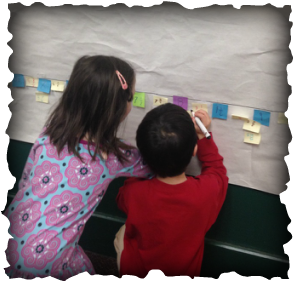 In 2016, we are launching a blog that spotlights some math practices around the school. This portion of the website also features our school wide work on developing "growth mindset" -- for everyone! -- as well as information about the math standards (by grade level) and some mathematical models and strategies you might see your student using. We offer resources about some hot topics: growth mindset, advanced and high achieving learners, students dealing with math anxiety, and fun ways to engage in math as a family. Stuck and frustrated with your homework routines? We offer some strategies and prompts for reinvigorating student thinking, ideas about creating a homework space, websites with video tutorials or games for extra practice, and explanations of some common math models and strategies. Check out a vast list of math-related apps available for K-8 students! The apps are listed by category, including some apps for enrichment that promote flexible thinking, estimation skills, and engaging real world contexts. Children's books are full of mathematical ideas! We offer suggestions or engaging students K-8 with mathematics in both fiction and nonfiction contexts.